I do love a good ol' bath all year round and especially in this Winter time that we're slowly approaching now, bath time seems like to be the best time. Usually I'm a bath at night time kinda gal and it's almost like a 'time out' before bed just to relax my muscles and prepare myself for the land of nod. This Bath Salt DIY includes less than 5 ingredients and can be made all from the comfort of your own Chemistry lab, I mean- kitchen. 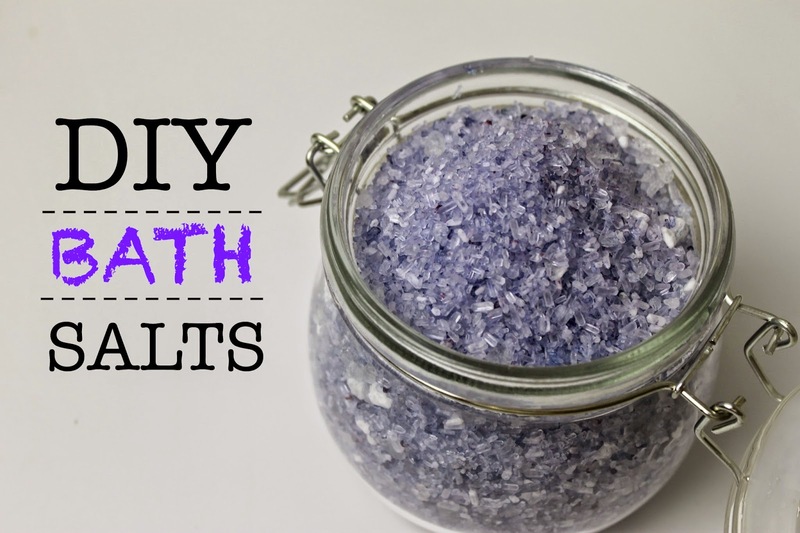 Not only do these Bath Salts smell heavenly, they're also aesthetically pleasing and make for a gorgeous decoration in the bathroom too. As I generally have baths at night, I've chosen essential oils that are going to help with the relaxation process such as Chamomile and Lavender to mix around with my Epsom Salts. 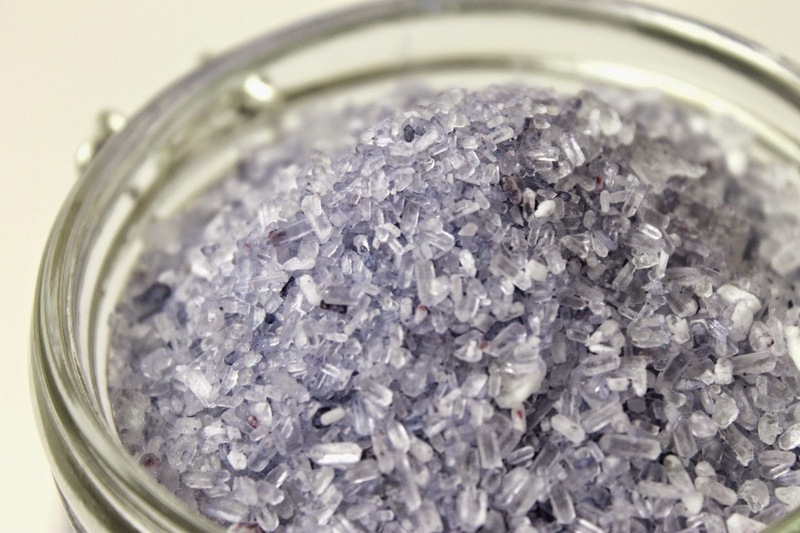 Most people, myself included- are deficient of magnesium so what better way than to get back those all important minerals and nutrients than having a bath filled with Epsom Salts, especially since the benefits are so fantastic! Mix together all the ingredients, adding a drop or two of food colouring (if you so desire) and voila! Literally that simple! Make sure you mix it well enough so that the essential oils and colour is distributed evenly throughout the mixture before you use/ store it. **In place of the Soda Crystals, you may choose to use 3-4 Tbsp of Baking Powder which helps to soften the water and leaves your skin feeling super soft too! Unknowingly, I've been conducting this DIY for years but have never really thought to make it in a batch as big as this! Now I have Bath Salts at my disposal for the next few months- score! Ever taken a Salt Bath? What do you put in yours? I am definitely going to try and find all of those ingredients! I love bath salts and have been using Kneipp ones for ages. Might be a fun idea to try to make a bottle myself! Definitely give it a go! I have been using them for the past couple of days and they have been so good for my tired muscles! I love bath salts because it always make me feel so relax and my body just feel really good after that. Never thought of making it myself though so this is brilliant! ps: The smokey eyes was fantastic and it worked! And it worked seriously good, I can finally rock smokey eyes thanks to you! I know, me too! Hooray for bath salts! YAY! I'm so excited for you! Love me a smokey eye! Cool! I've never tried that before. Sounds lovely though. Meals components intravenous vitamin and mineral therapy, flavorings and colors or unique foods themselves may also result in sensitivities, allergy symptoms and intolerances. With the aid of living an optimally healthful lifestyle, the body is provided with the first-rate situations to stay away from as well as heal from disease states.